Hibs are to fight the threat of Darnell Johnson being suspended for two matches after the defender was pulled up by SFA compliance officer Clare Whyte. The on-loan Leicester City player was booked for a foul on Celtic's Emilio Isaguirre which resulted in the Honduran left back being stretchered from the pitch during Wednesday night's 2-0 defeat by Brendan Rodgers' side. But despite the yellow card being shown by Scotland's top referee Craig Thomson, Whyte has decided further action is needed with a fast track hearing due to take place on Tuesday which left the 20-year-old free to play in today's Scottish Cup match against Raith Rovers at Easter Road. Whyte's decision is understood to have stunned Hibs with caretaker boss Eddie May, when asked immediately after the match if he thought Johnson's tackle merited a red card insisted it didn't, because a tackle by Celtic captain Scott Brown on Mark Milligan hadn't drawn that course of action from Thomson. 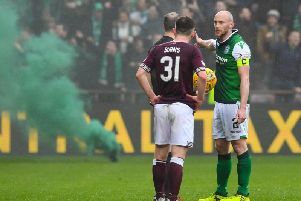 Hibs officials, it is understood, have been left bemused at how Johnson has been left facing further punishment when Brown, defender Jozo Simunovic and striker Oli Burke have avoided facing notices of complaint by Whyte. They were unhappy at an aerial challenge from Simunovic in which he appeared ot lead with his elbow on striker Oli Shaw who was forced off at half-time having suffered a head injury in that incident. And it was also felt Burke went to ground too easily inside their penalty area.